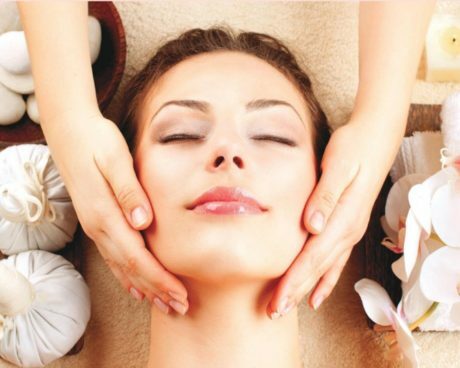 Why is East Mountain Massage including Thai Stem Facials as treatments? A lot of our patients have common complains: Migraines, Headaches and Tension Headaches, those who are having difficulties sleeping, or even have been diagnosed with or just experience high anxiety. Massage therapy alone has been scientifically proven to aide in reducing and in some cases completely alleviated these issues. By adding some herbal healing to the mix, it will increase the natural healing effects. The way Thai Stem is applied by steaming the stems, which adds hot hydrotherapy, opening the pores up to allow the herbal contents to be absorbed into the skin and giving the patient a relaxing experience while the herbs are doing their healing. Hibiscus with Rosehip: Both herbs contain high levels of flavonoids and other antioxidants, and rosehips are an excellent source of vitamin C. A tea made from rosehips and hibiscus has been said to help lower your blood pressure, support your immune system, and treat cancer. Eucalyptus: When applied to skin for revitalizing benefits, when inhaled easing congestion. Lemon balm, or “Melissa officinalis,” is an herb belonging to the mint family. It’s a strong anti-inflammatory and has antibacterial action. Lemon balm is classified as being calming, soothing, healing and tightening on the skin, whilst also stimulating circulation. 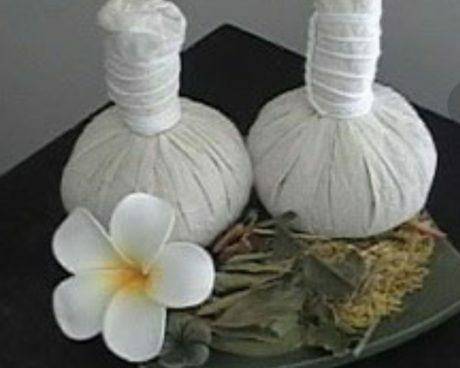 It is thought to be great for acne and sunburned skin. Peppermint: when used as aromatherapy can help with calming of the nervous system. When applied to the skin it helps relieve joint and muscle pain associated with sprains, strains, and rheumatoid arthritis. When ingested it helps to speed and ease digestion (and which may also support healthy cholesterol levels). Lavender: Applied topically, Lavender is frequently used to reduce the appearance of skin imperfections. Add to bath water to soak away stress or apply to the temples and the back of the neck. Add a few drops of Lavender to pillows, bedding, or bottoms of feet to relax and prepare for a restful night’s sleep. Pomegranate: The Middle Eastern fruit is claimed to be effective against heart disease, high blood pressure and inflammation. It also contains vitamins A, C and E, iron, and other antioxidants (notably tannins). Sesame Stem: It has a powerful antioxidant, it possesses anti-bacterial and anti-viral properties. It brings the blood and nourishment to your skin. Sesame oil: This oil is rich in omega 6, calcium, magnesium, phosphorus, iron and vit B & E which have been used as products of beautification. it can provide you with glowing skin by maintaining skin flexibility, keeping it soft and supple. BC Glacier Clay: Found in a remote region of coastal British Columbia, Glacial Bay’s marine clay deposits are inter-tidal and submerged in clean Pacific seawater. They are refreshed with micro-nutrients, which has been proven to be very beneficial for skin and body care. The clay has a neutral pH balance of 6.9 and has high levels of beneficial minerals in conjunction with low heavy metals. The combination of which is ideal for skin and hair, detoxification and many other skin and body care uses. Red Velvet: Coconut base with hibiscus and rosehip. Our base Thai Stem. Benefits: It’s a powerful moisturizer that also helps to strengthen skin tissue more deeply and eliminate dead skin cells while quickly being absorbed into your skin. Contains high levels of flavonoids and other antioxidants. By adding Essential oils, in addition to what’s already in the Thai stem, can to enhance your facial treatment experience. Sinus: Coconut base with Eucalyptus, lavender, and mint. Our special sinus Thai Stem developed by Lisa Wilson RMT. Benefits: It’s a powerful moisturizer that also helps to strengthen skin tissue more deeply and eliminate dead skin cells while quickly being absorbed into your skin. By adding Essential oils, in addition to what’s already in the Thai stem, can to enhance your facial treatment experience. Sun Tamer: oatmeal base with pomegranate and lavender, eucalyptus, and mint. Our sun damage healing Thai Stem developed by Melissa Madsen RMT. Benefits: While the Oatmeal softens and moisturizes your dry, sun damaged skin, the natural herbs added will help rebalance the pH levels, while giving your skin a blast of antioxidants, vitamin A, C, E and Iron. By adding Essential oils, in addition to what’s already in the Thai stem, can to enhance your facial treatment experience. Face Renew: Sesame Base with Turmeric. Benefits: while sesame has a powerful antioxidant, it possesses anti-bacterial and anti-viral properties, it brings the blood and nourishment to your skin. Using the sesame oil with this Thai stem adds omega 6, calcium, magnesium, phosphorus, iron and vit B & E. It provides you with glowing skin by maintaining skin flexibility, keeping it soft and supple. We add Turmeric to the mix to help reduce acne and any resulting scars. The anti-inflammatory qualities can target your pores and calm the skin. By adding Essential oils, in addition to what’s already in the Thai stem, can to enhance your facial treatment experience. Side effects: you will have yellow skin for a few hours. Copyright 2019 East Mountain Massage - All rights reserved.